But before we take on Europe, let me quickly tell you to save the date for my annual Strategic Investment Conference, co-sponsored with my partners, Altegris Investments. And what a lineup we have this year. Already scheduled are my friends Dr. Woody Brock, Mohamed El-Erian, Marc Faber, Niall Ferguson, bond-fund star Jeff Gundlach, Dr. Lacy Hunt, David Rosenberg, as well as your humble analyst. And there are a few more blockbuster names we are close to finalizing. Most people who attend think this is simply the best investment conference of the year, and I think this one looks better than ever. It will be May 2-4 in the San Diego area. I will soon give you details about where you can go to register, but for now put it in your calendar. What better way to think about how to invest in these times than to hear some of the best minds in the world, all in one place? As this letter will suggest, I don't think this is the year you want your portfolio in typical long-only funds. There is a lot of tail risk this year coming from Europe. For those who are accredited investors and interested in alternative investments like hedge funds and commodity funds, which can help you navigate through these volatile times, let me suggest you go to The Mauldin Circle and register, and my friends at Altegris Investments will give you a call. I am finishing up a new Accredited Investor Letter, and they will send it to you for free as our way of saying thanks for talking with us. Now, let's jump right in. We started off this New Year's series by pointing out that the choices we make today are constrained by the choices we made in the past, and the choices we make in the future will be limited by the choices we make today. Europe chose to create a free trade zone, and then some of the countries proceeded to lock themselves into the gold standard of a single currency, relinquishing the ability to adjust any imbalances in their economies by changes in the prices of their own currencies. Interest rates for the southern tier of Europe dropped to levels never available to them before, and those countries responded by borrowing ever-increasing amounts of money to finance current spending. Then came the credit crisis, and budgets simply ballooned out of control, and debts began to get to levels that made the bond markets ask for ever-higher rates, as concerns about sovereign defaults began to rise. This problem was compounded by the fact that European banking institutions were allowed to leverage their purchases of sovereign debt by 30 or 40 to 1 their actual capital. That means even a default by a small country has potentially big ramifications. As it became clear that Greece was in trouble, European leaders at first thought that if Greece was given some time, it could get its budget deficit under control and then once again gain access to the bond market. In the summer of last year, after dithering through some 40-odd summits, it began to dawn on European leaders that it was not a short-term liquidity crisis they had on their hands but a solvency crisis. A fact that numerous commentators had been pointing out to them for quite some time. And as Greece began shake and bake its way to "austerity," the very act of cutting deficits pushed the country into recession, which lowered tax revenues and increased expenses, putting the elusive goal of a balanced budget even further off. We should quickly note that this is not just a Greek problem. Spain's "draconian" cuts have meant that its 6% deficit target for the year has this week been raised to a more likely 8%, making it harder to get back to even. For country after country, this is the Endgame. It is the end of the Debt Supercycle. Debt has grown to the size that it cannot be sustained. The market will not lend any more money on terms that can be afforded, and any efforts to cut spending and raise taxes will result in an even worse economy, in various degrees of recession, with falling revenues and rising costs. Europe has three main problems. 1. A growing number of its countries are insolvent or close to it. It is increasingly likely that the only way forward is for defaults of some type, to lessen the burden of debt to a level where it can be dealt with and that will allow the countries the possibility of growth, which is the only real answer to the problems they face. 2. 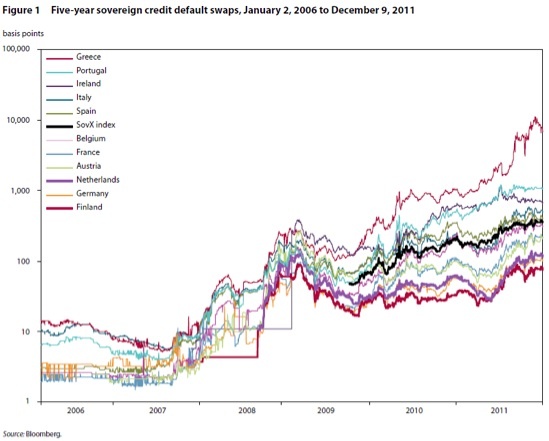 Because of growing fears of multiple defaults (just Greece would be bad enough!) most of the banks in Europe are seen to be insolvent and in need of hundreds of billions of euros of new capital. The interbank market in Europe is in a shambles, and banks park their cash with the ECB, at a lower rate of return, as that is the only institution they trust. They clearly do not trust each other. As an aside, I heard from many sources while I was Hong Kong and Singapore, meeting with readers and friends, that European banks (especially French) are cutting back on their trade lending, which is making normal commerce more difficult. Didn't we just go through that in 2008? 3. The real problem in Europe is the massive trade imbalances between the peripheral countries and the so-called core countries. Without the ability to adjust currencies, those trade imbalances will render any debt solution moot, as a country cannot balance its budget while it runs a trade deficit and its citizens and businesses also deleverage. I have written about this arithmetic problem on numerous occasions. There must be balance or there must be a mechanism to achieve balance. One cannot solve one problem without solving all three. Either they all get done or none truly get done. You can kick the can down the road by solving problems 1 and 2, but problem 3 will put you shortly back to square one. Europe is now trying to address problems 1 and 2. They are talking about a "new treaty" that will require austerity of a real kind, although I understand that Germany has put in a clause that gives it some extra time to achieve its own balanced budget. And the ECB is dispensing euros through the back door to banks, in exchange for anything resembling collateral. Not directly of course, as that is prohibited, but the same thing is being accomplished, despite objections in some quarters, mostly German. It was late in September of 1998. I was flying from New York to Bermuda to speak at a hedge fund conference, and found myself upgraded at the last minute, back in the day when I did not fly that much, so I was feeling rather happy. As the door closed, a patrician-looking gentleman stepped in and came and sat next to me, immediately picking up a file and burrowing into it. I had a book and the Wall Street Journal, so I was content to read. As soon as we took off, he asked for a scotch. He proceeded, over the next hour, to wage a very aggressive war on the diminishing cache of scotch bottles stored on board. (No, it was not Art Cashin. He doesn't fly.) It was an arduous campaign, but he was fully committed to winning. He glanced over to my Journal and noted some headline about the crisis that had occurred the previous week. I had been following the extreme market volatility with interest, but this was in the first decade of the internet, so most of what you came by you still read in print or heard on the phone. "They don't really know how close we came," he shuddered, his eyes showing the first signs of emotion – and fear – I had seen from him. That piqued my interest, and I engaged him, though without touching his precious hoard of scotch. I settled for a nice chardonnay. It turned out he was the second-ranking executive at one of the three largest banks in the country. He had been at the table in the NY Fed boardroom when 14 banks were forced to put in $3.625 billion to keep Long Term Capital from collapsing, with only Bear Stearns declining (one of the reasons they had no friends ten years later). The NY Fed president had essentially called all the heads of the banks, told them to be in the room, not to send proxies, and to bring their checkbooks. There was subsequently a lot of criticism of the Fed, but they did what a central bank is supposed to do in times like that: they made the children play nice in the sandbox. They were the only entity that could force the various monster-ego players to even sit in the same room with each other. "No one will ever really know," he said again. But of course, soon everyone did, as Roger Lowenstein wrote the must-read real-life thriller When Genius Failed. "We walked to the edge of the abyss, and we looked over." He proceeded to regale me with the stories of the negotiations, as the immensity of what would happen if they allowed the collapse dawned on the group one by one. They all had exposure to LTCM but did not realize the extent of it until it was too late. Looking back, it might have looked something like the credit crisis of 2008 if they had not acted, except it would have happened much faster. I can tell you that no one in that room wanted to write a $300-million check. It was not good for their careers. Interestingly, after two years the fund was liquidated and the banks got back their capital plus a small profit. Now, the bankers and leaders of Europe are getting ready to walk to the edge of the Abyss. It will be a long way down, and look like the 7th level of Dante's Inferno. Their first real look will come in the next few weeks, as Greece is negotiating aggressively with its lenders as to how much of a haircut they will receive and what sort of guarantees Greece will provide on the remaining debt (they are balking at putting the new bonds in a legal jurisdiction that will have some real bite if they default again, which they will). They are also negotiating with Europe about how much additional real austerity they will have to endure in order to be allowed to take on more debt. If they walk away and there is an uncoordinated default, it will guarantee chaos. Bank collateral will collapse and credit default swaps will be triggered, including many sold by European banks that are already essentially insolvent. The legal euphemism here is that if debtors "voluntarily" accept a 50% haircut, then no credit default swap protections will be triggered on those positions. But not all parties want to voluntarily take that loss (or an even greater one). If they are forced to do so, then the credit default swaps they bought come into effect. Greece can legislatively force them to take the haircut, but CDS contracts are written in such a way that that action would be seen as a loss, triggering the CDS insurance. The governments involved want everyone to accept, so there is no crisis. The funds simply want as much money as they can get back, and many are playing a very hard-nosed game. Can the holdouts be enticed with sweeteners that not all may get? Maybe different collateral? Or shorter terms, or …? The sad thing is that a 50% cut of the private lenders only gets Greece back to what will soon be 120% debt-to-GDP, from the current 170% and rising. 120% (which I consider optimistic) is just another, lesser form of insolvency, as Italy now understands. And if Italy is under pressure at 120%, then it is almost a given that the market would see Greece as still insolvent. There is at least one unintended consequence arising from the Greek settlement negotiations. Private investors thought they were buying a bond that was "pari passu," or equal with all other Greek sovereign debt. It now turns out they were buying junior, second-tier, subordinated debt. Something like a second mortgage on a home. You will take the first loss, so you then charge accordingly. But it now seems that the ECB, the IMF, and European public institutions are "more equal" than the private parties and will not have to share in the losses. The private lenders have found out they were taking subordinated risks while only getting senior-rate returns. It the public lenders were involved in the haircuts, then maybe it would only have to be a 30% haircut, or if it was 50% it would be enough to maybe get Greece to the point where it might have a chance; and the remainder of the debt would be in better shape, rather than this just being the negotiations for the first haircut, with more to follow. Every private lender in Europe now recognizes they are taking more risk when they invest in a sovereign debt instrument. This will have the effect of pushing rates up in the private market, like they have very recently climbed for Portugal (more on Portugal later). Europe faces a set of choices. They can lend Greece more money on promises to turn things around, which can't happen because of (1) the very austerity being imposed and (2) the 10% of GDP trade imbalance with the rest of Europe. But if they don't lend the money and there is an uncontrolled default, they will get to inspect that Abyss more closely than they would like. It will mean hundreds of billions of euros in losses at their banks, which will have to be bailed out eventually by taxpayers. Europe is worried about "contagion." If Greece gets a 50% reduction on its debt, will not Portugal point out that they deserve it more? There have been deep fiscal cuts by the free-market government of Pedro Passos Coelho in an attempt to reduce the deficits, but estimates are that, even with those cuts, the deficit will still be 6%, falling only to 4% in 2013. And that is if things go well. The market is not acting as if it expects things to go well. Yields on Portugal's 10-year bonds climbed to 14.39% on Thursday. Credit default swaps measuring bond risk have reached 1270 points, pricing a two-thirds chance of default over the next five years. While Portugal's public debt of 113pc of GDP is lower than Greece's, the private sector has much larger debts and the country's total debt load is higher, at 360pc of GDP – much of it external debt. Jürgen Michels, Europe economist at Citigroup, says, "Without a sizeable haircut to its debt stock, Portugal will not be able to move into a viable fiscal path. We expect a haircut of 35pc at the end of 2012 or in 2013." "Portugal is a troubling case for EU officials, who insist that Greece is a 'one-off' case rather than the first of a string of countries trapped in a deeper North-South structural rift. The official line is that Portugal will pull through because it has grasped the nettle of retrenchment and reform. "Europe's leaders have vowed that there will be no forced 'haircuts' for holders of Portuguese bonds. If the country now spirals into a Grecian vortex as well they will have to repudiate that promise or accept that EU taxpayers will have to shoulder the burden of debt restructuring. While all eyes are on Greece, it is the slower drama in Portugal that will ultimately determine the fate of the eurozone." Let's turn to some charts from a well-written report called "The European Crisis Deepens," from the Petersen Institute, by Peter Boone and Simon Johnson. Both authors have a long list of credentials. The first one is a chart of the cost of five-year credit default swaps. Notice they all are rising. (This is a log chart, so the scale rises by a factor of ten for each level.) Now, notice that Portugal is where Greece was last year. Then pay attention to the fact that Italy is likewise where Portugal was last year. Just thought I would give you a preview of coming attractions, horror-movie edition. 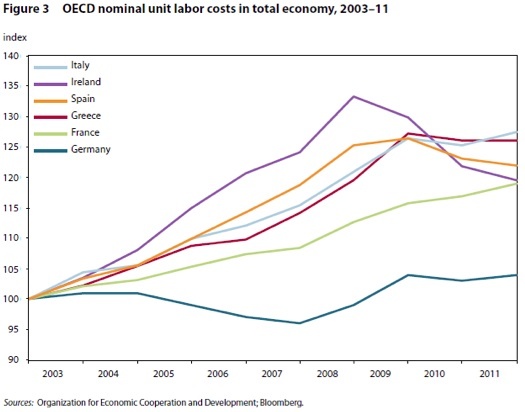 Then they offer us this chart, which compares the labor-unit costs of six countries in Europe. Only Ireland has seen their costs drop, as their labor has accepted pay cuts and productivity has increased. And pay attention to the ever-rising costs of France vs. Germany. This trend suggests France is on a path that Greece took. There are dragons down that path. And it also illustrates the problem of why it will be so hard for Greece to turn around without being able to resort to a currency devaluation. They have to endure a 30% pay cut relative to core Europe if they want to compete. There will be no volunteers in Greece for such cuts. After two years of IMF and European institutional involvement (meddling?) in Greece, there has been hardly any movement in Greek labor costs. Greece is not alone. Are you reading of any general pay cuts in the proposed solutions for Italy, where labor costs are now above those of Greece? Likewise, no move in Portugal (not shown in graph). The entire eurozone is out of balance, and no one is making any moves to deal with it or even acknowledge the basic problem. Much of establishment Europe was predicting a positive GDP for the region only a month ago. The recent trend suggests the data they were smoking was hallucinogenic. And given the seriousness of the problem, it must have been primo stuff. Germany was in recession for the 4th quarter of last year and is likely to be there this quarter, which is the technical definition of recession. Clearly, peripheral Europe is in recession, some countries in what looks like it could be called a depression. 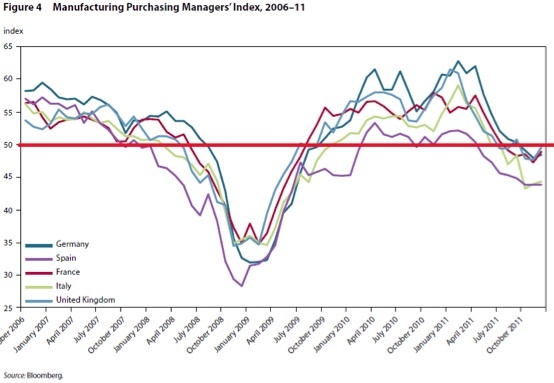 Below is the Purchasing Manager's Index for six major countries in Europe. I have added a thick red line at the 50 mark, below which there is negative growth. With all of the above as a backdrop, let's now see if I can outline the choices Europe faces. First, let's take Greece, because it is instructive. Greece has two choices. They can choose Disaster A, which is to stay in the euro, cutting spending and raising taxes so they can qualify for yet another bailout; negotiating more defaults; getting further behind on their balance of payments; and suffering along with a lack of medicine, energy, and other goods they need. They will be mired in a depression for a generation. Demonstrations will get ever larger and uglier, as the government has to make even more cuts to deal with decreasing revenues, as 2.5% of their GDP in euros leaves the country each month. There is a run on their banks. Any Greek who can is getting his money out. Greek voters will then blame whichever political group was responsible for choosing Disaster A and vote them out, as the opposition calls for Greece to exit the euro. Which is of course Disaster B. Leaving the euro is a nightmare of biblical proportions, equivalent to about 7 of the 10 plagues that visited Egypt. First there is a banking holiday, then all accounts are converted to drachmas and all pensions and government pay is now in drachmas. What about private contracts made in euros with non-Greek businesses? And it is one thing to convert all the electronic money and cash in the banks; but how do you get Greeks to turn in their euros for drachmas, when they can cross the border and buy goods at lower prices, as inflation and/or outright devaluation will follow any change of currency. It has to. That is the whole point. So how do you get Zorba and Deimos to willingly turn in their remaining cash euros? You can close the borders, but that creates a black market for euros – and the Greeks have been smuggling through their hills for centuries. And how do you close the fishing villages, where their cousin from Italy meets them in the Mediterranean for a little currency exchange? What about non-Greek businesses that built apartments or condos and sold them? They now get paid in depreciating drachmas, while having to cover their euro costs back home? Not to mention, how do you get "hard" currency to buy medicine, energy, food, military supplies, etc.? The list goes on and on. It is a lawyer's dream. There is a third choice, Disaster C, which is worse than both of the above. Greece can stay in the euro and default on all debt, which cuts them off completely from the bond market for some time to come. This forces them to make drastic cuts in all government services and payments (salaries, pensions etc. ), and suffer a capital D Depression, as they must balance their trade payments overnight, or do without. Then they choose Disaster B anyway. The only real options are Disaster A or Disaster B. Whether they opt to go straight to the drachma (Disaster B) is only a matter of timing. They will get there soon enough. Why then do they wait? What's the point of going through all these motions? Because Europe fears a disorderly Disaster B. For the rest of Europe, it is the Abyss. The Greek hope is that Europe (read Germany) keeps funding them in order to keep back from the edge of the Abyss. As one European diplomat noted, "There is a growing sense that despite the valiant efforts of Papademos … the reluctant Greek establishment is biding its time to the next elections, banking on the assumption that the world will continue to bail them out, no matter what." Europe is getting closer to the point where it must make a decision about what to do with Greece. In theory, the deadline is March 29 for the next round of funding. It is a game with very high stakes and deadly serious players. Can Sarkozy be seen as weak and giving in to Greece, with elections coming up in April? Can Merkel appear to give in and keep her troops in line? There are elections not long after that in Greece. Can Papademos cave in to further cuts and promises on future debt that will be hard to keep and intensely unpopular? The markets are getting exhausted. There will be no private market for Greek debt at any number close to what is sustainable. Greece will be on European life support for a very long time if they stay in and there is no disorderly default. It will mean hundreds of billions of euros over the decade, debt forgiveness, etc. There are no good choices. And Europe will all too soon face what to do with Portugal, which will want to dispense some haircuts of its own. Don't forget Ireland, which is very serious about not paying the debt the previous government took on for its banks in order to pay British, German, and French banks. That is a default that is in the cards. I think "polite" Ireland is just waiting until its $60-billion default is seen as small potatoes, which will not be too long, as Italy must raise almost €350 billion just to roll over current debt. Italy projects that its deficit will be down to 2%, but if Europe goes into recession that projection goes out the window. The bottom line is that Italy (and most likely Spain at some point) cannot raise the debt it needs at rates it can afford without massive European Central Bank involvement. Rates are already approaching 7% again. That is unsustainable from an Italian point of view. Germany must be willing to allow the ECB to take on massive balance-sheet debt, or Italy will not make it without haircuts. And a mere 10% haircut for Italy dwarfs what is happening in Greece – and doesn't do much for Italy. If they go for a haircut, it will be much larger. French banks holds 45% of Italian debt. Italy is too big for France to save. They cannot even backstop their banks if Italy becomes a solvency risk. They simply cannot get their hands on that much money without destroying their balance sheet. The most recent downgrade of their debt was just the first of many. Europe will have to make its choice this year. Either a much tighter, more constrictive fiscal union with a central bank that can aggressively print euros in this crisis, or a break-up, either controlled or not. I don't think they can kick the can until 2013, as the market will not allow it. Either the ECB takes off its gloves and gets down to real monetization when Italy and Spain need it, or the wheels come off. The quote at the beginning returns to mind: "If we want everything to stay as it is, everything will have to change." Like any long trip, the drive (or flight) seems to take forever, particularly if you are very young or you are an investor. But then suddenly you are there. The LTCM crisis mentioned above took a long time to develop, but then it ended with a bang. One day Lehman or Bear is a big player and the next they are gone. I think this is the year the crisis moment for the euro arrives. Let's hope they are ready. When Europe approaches the edge of the Abyss and looks over, the rest of the world gets to take a look, too. We can all be taken to the edge and over. I was reminded while in Singapore and Hong Kong how much we all need Europe to come through this. Europe has problems that are structural and can't be fixed with just another treaty or more ECB liquidity. With that in mind, here are my thoughts. 1. The European Union works, mostly much more than less. Keep the free trade zone. There are countries that work just fine that are not in the euro. We live in the world of computers. Currency exchange is a computer operation and relatively easy. And keep working on coordinating with the rest of the world. Take advantage of what you can do together. We are all better off with a united Europe. Until such time as there are stable labor and productivity markets across Europe, don't press for a single currency. Single currencies don't insure there will be no conflict. Really integrated free trade and open borders do. 2. Admit the euro just doesn't work for some countries, and let them leave the eurozone (but stay in the free trade zone, like Denmark and Sweden are now). Establish as orderly as possible a path for a country to revert to its old currency. Yes, there are going to be some very large losses. If you control it, they will be far less than if you don't. You can set up a two-tier system, just as you did when you created the euro. And pass some laws so everyone isn't spending the next two decades suing everyone else. Deal with it like adults who want to be friends after the divorce rather than enemies for life. If you have to make up some rules, then make them up. But do it quick. The longer you take, the more it will cost you (and the world). 3. Greece has to be told no. No more loans. No more threats. If they want to stay, then let the market deal with them. I doubt it will be kind, but they have to take responsibility for themselves. Nobody forced them to borrow too much. Cut your losses now. Use the money to salvage your own banks. When (not if) Greece decides to go, help them with some humanitarian aid (medicines and emergency supplies) but stop piling on debt they can't pay. Work out the terms so they can get on their feet and go on with their lives. Allow them to stay in the free trade zone. And learn your lessons. Be careful whom you lend money to! 4. Sadly, the same goes for Portugal, although with a reasonable and very healthy haircut they may be able to stay. 5. Ireland is not going to pay that bank debt. Get over it. Just let the ECB swallow it. Then Ireland will pay the rest of its government debt and can grow its way out of its problems. They have a positive trade balance. Besides, who doesn't love the Irish? 6. Italy and Spain are problems. If they stay they are going to need some major ECB help on rates while they get their deficits under control. Either do it or don't, but don't keep the world in limbo. Germany needs to make a decision and make it very publicly. 7. I don't know what to suggest to France. That is the toughest question. They are losing labor competitiveness with Germany and others, and already have taxes that cannot go much higher, large fiscal deficits, poor demographics, and huge future unfunded liabilities in the form of health-care and pension benefits. They have time to get things sorted out if they will use it (like the US). The world surely hopes they do. The concern about the problems of French banks was voiced everywhere in Hong Kong and Singapore. They are integral to world trade in ways that US banks (or others) can't come close to. They just have the experience and infrastructure in making those trade loans. You can't build that up in a short time. A problem with French banks would be a problem for world growth, which is already slowing down. I know the markets are discounting a happy ending to the euro crisis. I just see the substantial "tail risk" and suggest you manage accordingly. Large pensions and foundations may be happy if they end the year where they started. Smaller investors should assess their risk tolerance from the perspective that Europe does not work through its problems. I came back to Dallas by way of Tokyo. As I walked to my gate, I noticed a crowd and then lots of cameras. Clearly a celebrity of some import was getting on the plane. I boarded and went to my seat in first class (you've got to love system-wide upgrades!). I asked the steward (who I knew from previous flights, which says I have been on too many) who was getting on. It turned out it was Yu Darvish, the best baseball pitcher in Japan, who Nolan Ryan had just signed to pitch for my Texas Rangers. He is young (25), good looking, and quite tall at 6'5". And he seemed the perfect gentleman, smiling and quite willing to sign autographs. Yes, I got one, but it was for my kids. I'll just save it for them for a while. The Texas fans are going to love him. He just has that charisma. Let's hope he can keep his sub-2 ERA when he pitches in The Ballpark. Then they'll go crazy. It is time to hit the send button. It is the wee hours of Saturday morning and I am still on Asia time, it seems; but I need to get to bed and try to adjust. Have a great week! Jan. 29, 2012, 7:06 p.m. The solution part of the article is interesting, but it just waves it’s hand at the individual country level. In any economic crisis, you have to first figure out what the missing element is. Just like when a car doesn’t start and you figure out first whether the problem is spark, fuel, or air, when an economy fails you have to figure out whether the problem is missing capital investment, efficiency, or target market. One of the biggest systematic economic problems we see is when economists, without understanding the problem, try to fix a target consumer market problem with measures designed to encourage capital investment, only to discover to everybody’s astonishment that companies with plenty of accessible investment funds won’t increase infrastructure to support a shrinking market. The tools for making these determinations are out there, but they are universally ignored by people with religious faith in the free market or by people with a vested interest in catching large groups of people in a debt trap. Jan. 24, 2012, 12:04 a.m. The variety of takes on who is at “fault”, reflected in these replies, is an example of world politics in microcosm. “It wasn’t the Euro it was the dumb banks”; “Mr. Maudlin doesn’t discuss the REAL issue here the European Welfare Sate”; “one cannot pay people to do nothing”. Of course, none of these responses shows a clear understanding of behavioral economics. Even Hamlet understood this: ” Use every man after his desert, and who shall ‘scape whipping? Use them after your own honour and dignity. The less they deserve, the more merit is in your bounty.” That bounty, unfortunately, is gone from our current social order. Unlike the country that came up with the “Marshall Plan” and used its own resources to get Europe and Japan back on their feet we now follow a precedent more similar to the reparations demanded after WWI that helped lead to the impoverishment of Germany and WWII. The irony of fiscal conservatives and the Christian right sharing the same political views is the vary lack of Christian charity or compassion. Some of us, like James Chaillet, label any trace of such compassion as Socialist. Yet I don’t see the same abhorrence to CEOs who took millions from their failing companies, or those who lobbied for lower taxes for the rich (so that we could be the lowest taxed country in the Western World). Could any of us focus on constructive ways to contribute answers to the problem that minimize the suffering of those who DO work and can least afford the coming depression? As a very modest proposal I suggest that those who can most afford to pay do so: Both in Greece, which has finally started to go after its wealthy tax cheats, and in the U.S. where the large majority of voters agree the budget balancing should include both tax increases and budget cuts while their representatives refuse to do either. One last item. John now seems to acknowledge that Greece leaving the Euro is possible though his book suggests any country leaving (Italy is the example cited) would be impossible to control. Of course, it isn’t. It would be expensive but the EU could issue an alternate currency during the bank holiday proposed above and allow citizens of its own country (or those who are not citizens of Greece) to exchange the old currency for the new during a limited time period. Naturally, money laundering efforts by the Greeks would still have to be stopped therefore limits on the amount being exchanged without a formal accounting of where the cash came from would be prohibited. Jan. 23, 2012, 3:51 a.m.
Jan. 22, 2012, 11:45 p.m. Thank You John for this wonderful ,insightful letter. Jan. 22, 2012, 12:37 a.m.
A great read and very helpful in understanding the “crisis”. However, Mr Maudlin doesn’t discuss the real issue here - The European Welfare State and can it continue or not. The debt crisis in Europe (and soon in the US) came about because politicians spent much more than their governments took in through taxes - taxes already high and focused on the wealth producers. The politicians did this to maintain popularity with the masses that vote and, thus, to maintain their own power and position. Now, however, Europe overall is losing the competitive battle with the emerging nations of Asia and South America and China and India. The demographic landscape continues to change with fewer younger workers and more older retirees and retiree wantabees. The only near term solution to that is rapid and large scale immigration - which should go down well in France and Germany. Otherwise, the only way to keep the problem from happening again ( assuming it is fixed) is to ,perhaps slowly, but steadily dismantle or significantly downside the welfare state. How likely is that to happen? Oh! and downsize the bureaucracy because if it doesn’t happen, the hope of technological advancement bailing out Europe won’t go far. Jan. 21, 2012, 9:44 p.m.
Jan. 21, 2012, 9:39 p.m. I wonder what would happen if the PIIGS decided to accept their bonds at par for payment of taxes. Sure it would be inflationary but so would leaving the euro and issuing a fiat currency backed by the “full faith and credit” of Greece, Portugal, Spain or Italy. What would you pay to own New Drachmas or New Lira? Not much. It might even generate some buying interest. If you were Greek and could buy a bond for 50 cents on the euro and get 100 cents for it on your tax bill you’d start buying with both hands and the price would skyrocket. Jan. 21, 2012, 9:34 p.m. If the ECB can issue free money (1pct) to all the banks that need it (which is most/all) how does the music stop? Seems like the market has gone straight up since this facility was put in place. Quite clever, actually! The music has to stop but when? This week with Greece? Also, do you think the entire PSI (including hedge funds) agrees this week to thee 70pct plus haircut? If it fails do markets crash?